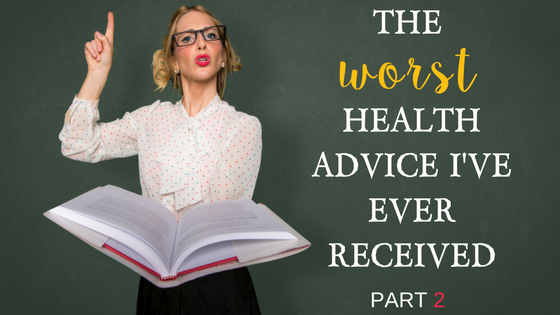 We are midway through this 3-part series I’m sharing on the “Worst Advice” I have received from fitness “professionals” that I have learned is simply BAD ADVICE. Last blog (link here), I shared with you the fact that some professional football players told me that "I shouldn’t do so many lunges since I already had “thick thighs.”' So not only was this RUDE advice, but it was very BAD advice because as I went over, the LEANEST my thighs ever got was also the MOST and HEAVIEST amount of lifting I had ever done! It is backwards to our female intuition, but it is the TRUTH about women’s bodies. We need muscle to burn fat. Today’s story is also some bad advice from another male trainer who really offered me some terrible advice while I was beginning to thinking about training for the bikini competition. This was when I was 29-years old and I was working part-time at my favorite gym in the whole world, Bodies by Perseverance in Denver, CO.
A trainer that worked there at the time (before he was let go) had offered to train me for free for a few sessions and was one who was pushing me to consider doing a bikini competition. At this time I was very suspicious of the whole process (which proved to be good intuition on my part that I should have trusted) because I was seeing a lot of girls lose a TON OF WEIGHT, but they were REALLY CRANKY and irritable the whole time. Then, once the show was over, I saw the grand majority GAIN ALL THE WEIGHT BACK and then some. Well, when this trainer revealed to me his master strategy for how he was going to train me, I knew this was the reason why! He told me, and I quote, “You need to burn as many calories in exercise as you eat in the day.” End quote. So, his “diet plan” for me would include a menu of 900-1200 calories total (which for me an my 5’10” frame is WAYYYYYY too low) of virtually no carbs, and he also expected me to BURN about 900-1200 calories a day doing EXERCISE! This is not only BAD ADVICE but this is DANGEROUS advice that can seriously harm your metabolism. I obviously did not hire this trainer to do my competition and I did still suffer some of the effects of the more extreme diet and exercise programs all warrant for doing a show, but at least I didn’t cause grave, sometimes irreversible damage that his advice could have cause me. 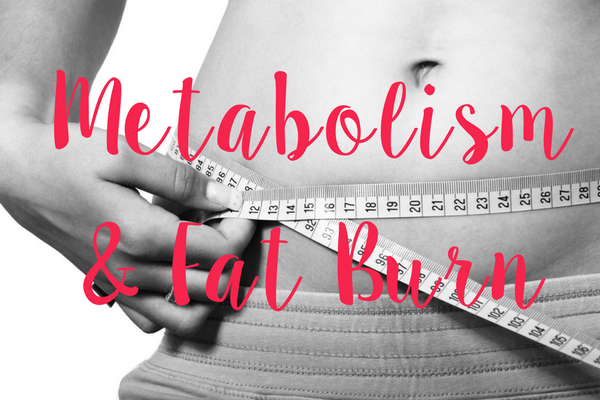 Let’s set the record straight on your METABOLISM and HOW MANY CALORIES TO EAT or BURN each day. —If you starve your body either by eating too few calories or burning too many calories (or both) you will slow down your metabolism and will have an incredibly hard time speeding it up again. This makes it nearly impossible to burn fat and lose weight again. If you were to lose weight this way but then gain it back (because your body thinks it's starving so it kicks up your appetite and cravings) you will have a MUCH HARDER time losing weight again. Your body does not forget the times when you’ve starved it. It won’t be so quick to lose its fat reserves next time. —Metabolic experts have research based evidence that says that to avoid slowing down of your metabolism, your goal should be to eat as much as possible while still showing signs of weight loss. The process will go in a stepwise fashion of slowly decreasing calories or increasing calorie burn via exercise to "test and see" how much you can eat while still showing results. This will take TIME and PATIENCE but will be well worth the effort in order to maintain the metabolism as much as possible. So, at my size (5’10”, 157 lbs) and age (34 years), I burn about 2,000-2,100 calories a day just from my everyday life (taken from my Apple Watch). If I exercise for 30-45 mins and take a leisure walk, I may get up to about 2600 calories burned per day. This means, to keep my metabolism revved up, I need to eat no less than 1600-1700 calories per day on non-workout days or 2100-2300 calories per day on workout days. (This is if I want to lose weight). The fat loss process needs to go much SLOWER than you think it does. For example, if I have a rough deficit of 500 calories per day over the course of a full week, I will at most lose 1 lb of fat per week. Now, hormones and inflammation, and all that will sway the “weight” part, but you can rest assured that this will allow for fat burning that you will notice more over time. —Metabolic damage is very serious that shouldn’t be taken lightly. Because of the surge of women deciding to do bikini or bodybuilding competitions, we are seeing a rise in the damage done. Things like autoimmune disorders like Hashimoto’s (Thyroid), adrenal fatigue, and whacked out estrogen/progesterone (from any extended stress) can all result from this aggressive approach to weight loss. Your hormones matter!! Take caution. While all this physical effects are important to address, but to me these consequences of physical and metabolic damage is small in comparison to the SPIRITUAL damage and the condemnation you feel when you lose weight and gain it all back because your body is fighting against you “starving” it for quicker results. It only took me 5 months to lose 7% of body fat, but it took me OVER A YEAR and a LOT OF GOD’S GRACE to help me forgive myself for doing it and gaining the weight back. When you change anything physical about your body you will do so by either BUILD-UP your Spiritual muscles or BREAKING-DOWN your Spirit. It's one way or another. And the way that society teaches us usually ends up on the destructive side toward our Spiritual growth. The reason why women take such drastic measure to change their body is because of an unhealthy relationship with their body. There are so many mindset barriers and lies that women will believe about themselves that this program can help set you straight. It also teaches you how to strengthen your Spirit which builds the patience, endurance, and self-control that are all pivotal in winning the fat loss game long term! I’m REALLY excited to invite you to join! Again, doors open on April 3 and the close on April 9th! So don’t miss your chance to transform your life! Please join the waitlist HERE to learn more! her Health Lounge opens April 3! The 26-week journey to a LIFETIME of health success starts on April 10! 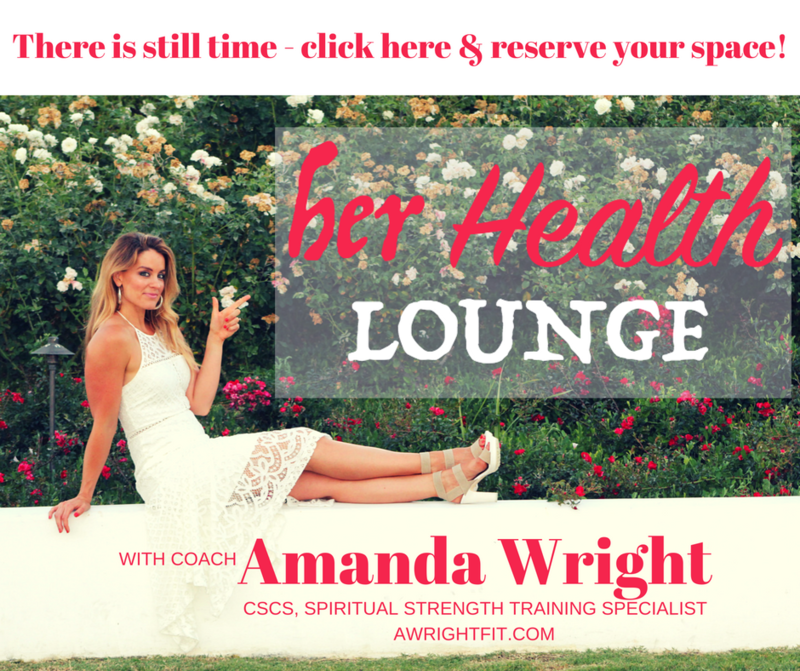 The her Health Lounge will be open for limited members starting April 3! To be the first to know, put your name on the list HERE. You'll get a nice little discount too!